Evaporative cooling is a ducted air conditioning system that is made up of a central cooling unit, which is connected to a number of outlets. The cooling unit is installed on the roof and the outlets (or ducts) are installed in the ceiling at strategic locations throughout the house. Cool fresh air flows through these outlets into every room of your home that you want cooled. The cooling unit fan draws in fresh air from outside your house. (The hotter the air is to begin with, the better the cooling effect.) The air is cooled and filtered as it passes through moistened pads, before flowing through the ductwork and into your home – just like a cool, refreshing breeze. Evaporative coolers not only use electricity to run but also water. ducted units (medium size) cost 12 to 28 cents per hour. Actual costs depend on the cooling capacity of the unit and the fan speed at which the unit is run. The amount of water an evaporative cooler uses depends on the humidity of the day and the fan speed that the unit is set to. Portable units can use up to 4 litres per hour while a central ducted evaporative system could use up to 25 litres per hour. Ducted evaporative coolers need to refresh their water supply to reduce salt and other waste build up. Different brands have their own water management systems built in so talk to us to find out what the approximate water usage of your unit will be. Find out more about the running costs for different cooling systems. Evaporative cooling is based on a totally natural process of using water to cool the air which means it doesn’t dry out the air, irritate your skin, throat or eyes, or affect the environment unlike refrigerated cooling which makes the air dry and uses refrigerants which may harm the environment. Evaporative coolers are also up to 50% cheaper to install and seven times** cheaper to run than refrigerated cooling. Evaporative cooling is the healthiest way to cool your home because it replaces stale old air with clean fresh air many times an hour – remember, you keep your doors and windows open. The air inside your home is never re-circulated which means smells and airborne germs are expelled. You don’t just benefit in the summer. You can simply turn on the fan and remove the stale air from your home in winter too. to maintain a cooler temperature, evaporative cooling requires that the doors and windows of your home are left open unlike refrigerated cooling which requires you to keep doors and windows closed. 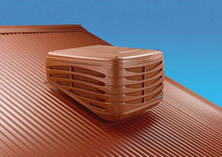 in winter, close or cover air outlets to prevent heat losses.